Fran was like, “Hey, can I have the keys to the blog?” and I was like, “Sure, obviously,” because I’m no ding-dong — I know that Fran knows how to bring the Quality Content, but then I show up for work in the morning and what’s happened? THE WHOLE BLOG IS COVERED IN CRITTERS. Well, somebody is going to have to deal with this. And that’s you, dear reader. It’s you. Chuck has been tweeting and blogging a lot lately on matters of Authorial Mental Health and Happiness and that synced up with a side project of mine — drawing some of the brain weasels and head dragons that sometimes set up shop northwards of my heart while I’m writing, working, not working, going to conventions, not going to conventions, etc. Sure there are happier critters around these parts, but Errant Critters are currently easier to trap and sketch for posterity. 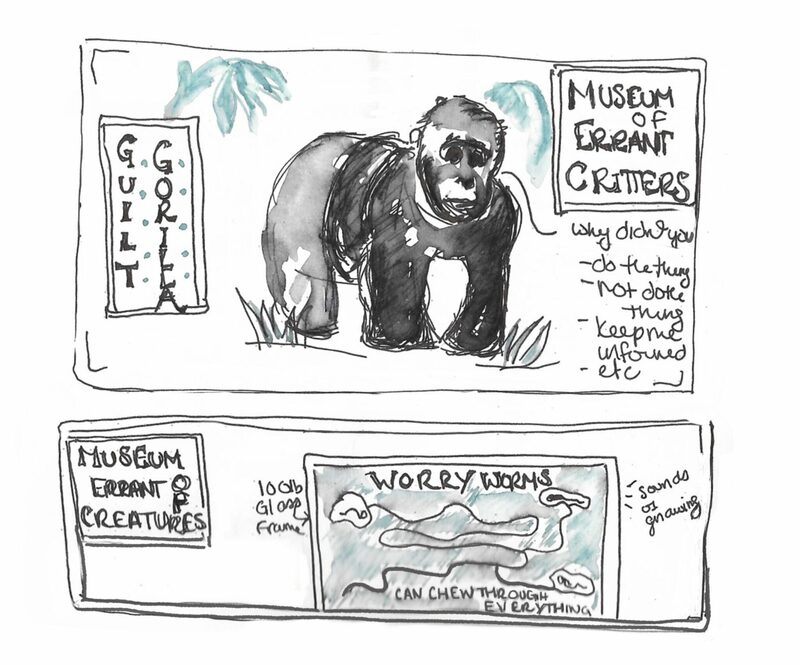 When I told Chuck what I was up to, he offered to let me park the Museum on his blog for a little while… and luckily he didn’t ask about care and feeding so I’m just going to leave them here to eat all the food in Chuck’s murdershed. Visit our exhibits to learn tips and tricks for Critter Management… (results not guaranteed). In particular, we’ve found that identification and discussion helps with management of many of these critters. At least, it helps with identifying the gnawing sounds in the dark of night. Migratory and nocturnal, the Despair Narwhal’s sharp horn and plaintive song wake creatives up in the middle of the night with intense feelings of doom. 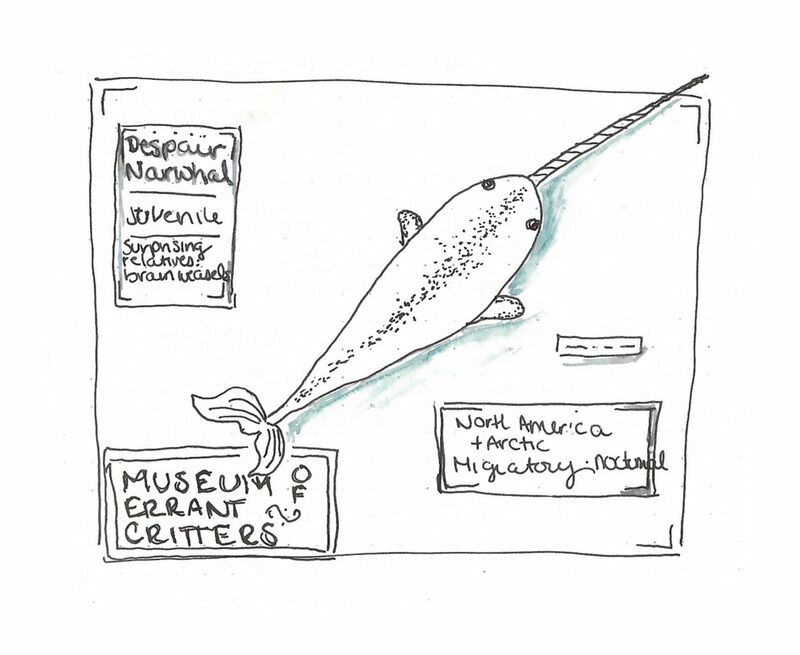 Despair Narwhals, being composed mostly of mist and doubt, often evaporate with a good dose of morning light, application of food, or starting a new project. 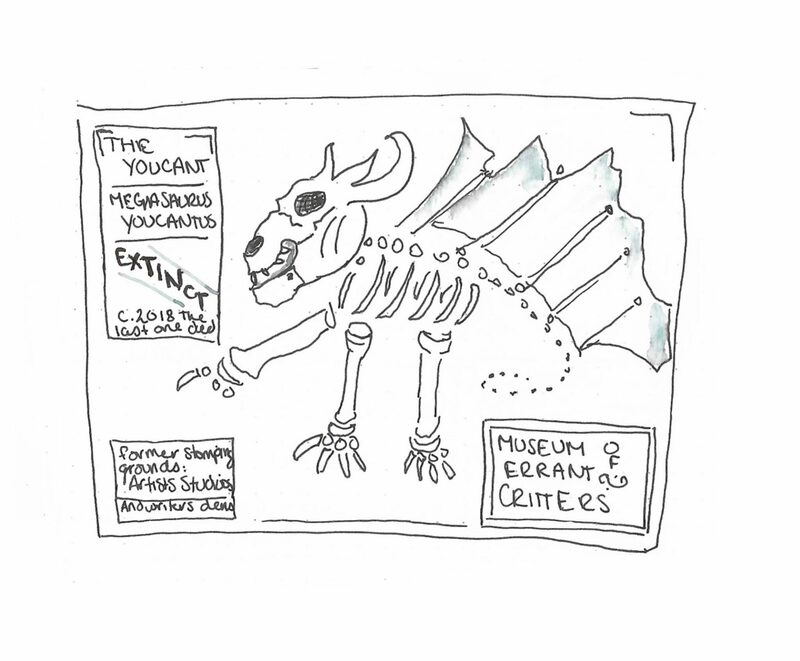 The megasaurus Youcant once lurked artists studios and creatives’ desks worldwide. 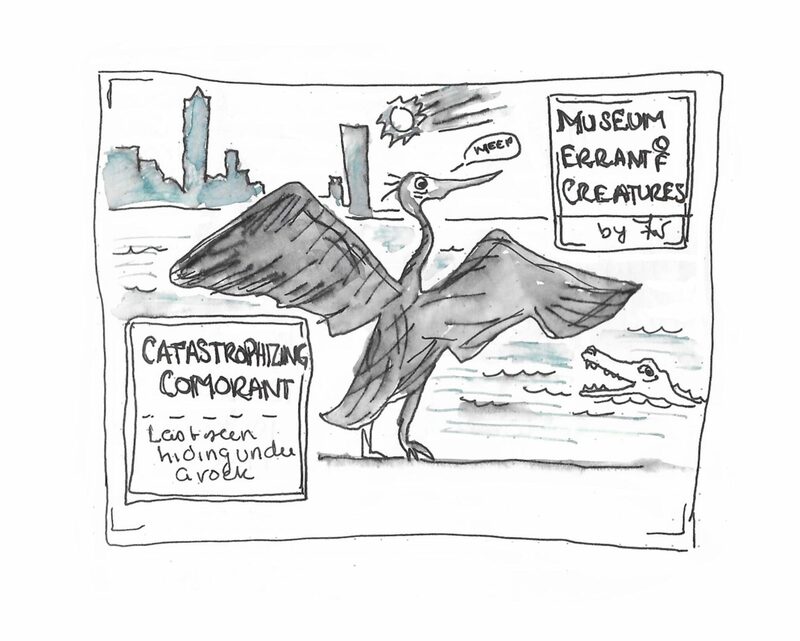 Currently extinct, the creature was put out of business by a rapid, global outbreak of Why The Hell Not in 2016. The sharp-toothed brain weasel is a rapid breeder that thrives on grey matter. Usually seen following an infestation of doubt devils or worry worms, these critters’ lifespan lasts as long as you feed them. Often found hovering, wings flapping, around the worst possible outcomes. No, worse than that. Even worse. Yep, that one. This bird is sure the worst will happen and demands that you make plans for this outcome, often instead of doing other things. Care and feeding involves a nap, some lunch, and a long look at other possibilities. Numerous, but small, these critters can chew through anything, if left festering long enough. Writing down their names sometimes helps, as does telling them you’ve got better things to do than watch them eat. In some cases, they signify something left unaddressed, but not always the thing they’re chewing on. 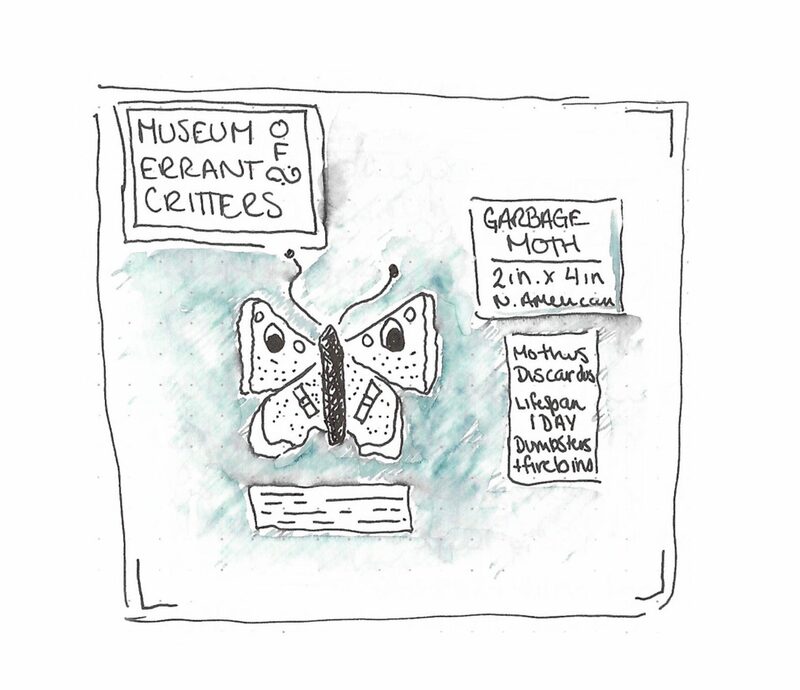 Attracted to dumpster fires, train wrecks, and twitter, these moths’ bright colors and spectacular tendency to spontaneously combust can devour hours, days, even weeks. When you look back at the missing time, you might not even remember what attracted their interest. Solution: accountability software, net nannies, a trip to a wifi-free zone. 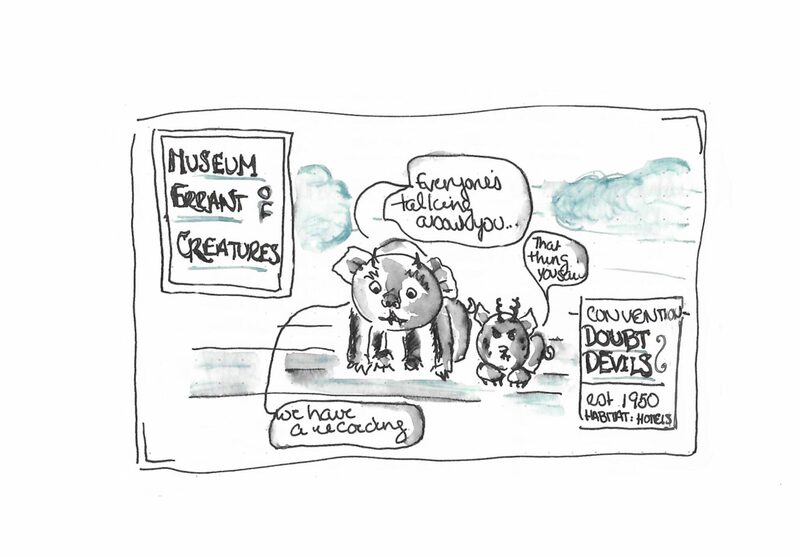 Known to frequent conventions, speaking engagements, and presentations, doubt devils, much like their cousin the cartoon tasmanian devil (hired long term by Warner Brothers) like to arrive in a whirlwind about midway through any multi-day event and helpfully repeat back to you a distorted version of things that you said, did, or didn’t do. Cause is unknown, but having a strong desire to be part of a community can be an attractor. Cures include checking in with a friend, stepping away from convention overload for a few minutes, and reminding yourself that almost everyone feels this way sometimes. Found lazing in deep task lists, this platypus doesn’t really care what you need to do, it wants you to play minesweeper or maybe just watch some YouTube for as long as possible. Set a timer and do a few minutes of downtime if you’re feeling distracted. The platypus is useful for giving yourself a break, just don’t let it eat your clock. 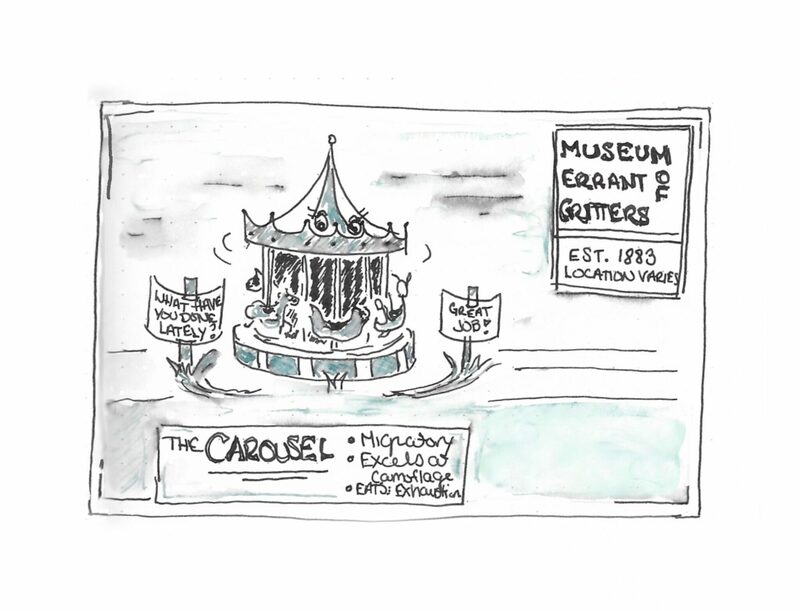 A master of camouflage, the Carousel is a slowly turning critter that can make you forget your own successes in order to ask you, repeatedly, what have you done lately. Best way to overcome: celebrate your wins, no matter how small. 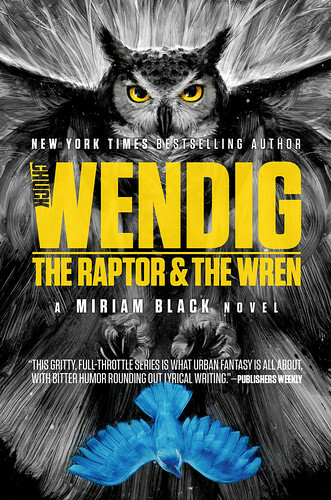 Fran Wilde’s novels and short stories have been nominated for three Nebula awards and two Hugos, and include her Andre Norton- and Compton-Crook-winning debut novel, Updraft (Tor 2015), its sequels, Cloudbound (2016) and Horizon (2017), and the novelette “The Jewel and Her Lapidary” (Tor.com Publishing 2016). Her short stories appear in Asimov’s, Tor.com, Beneath Ceaseless Skies, Shimmer, Nature, and the 2017 Year’s Best Dark Fantasy and Horror. She writes for publications including The Washington Post, Tor.com, Clarkesworld, iO9.com, and GeekMom.com. You can find her on Twitter (@fran_wilde), Facebook (@franwildewrites), and at franwilde.net. 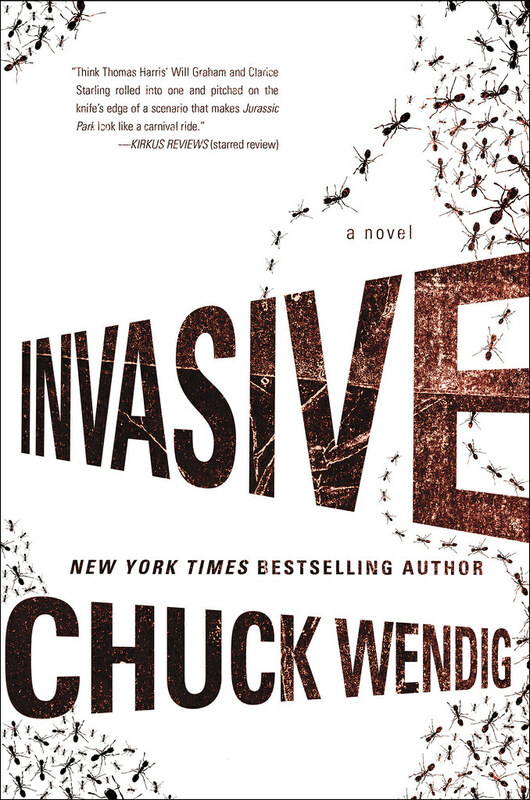 Thanks for hosting again, Chuck! I promise they’ll behave… sometime. Exactly. I’ve learned, over the years (thanks in large part to NaNoWriMo,) to celebrate all victories, no matter how small or seemingly insignificant. 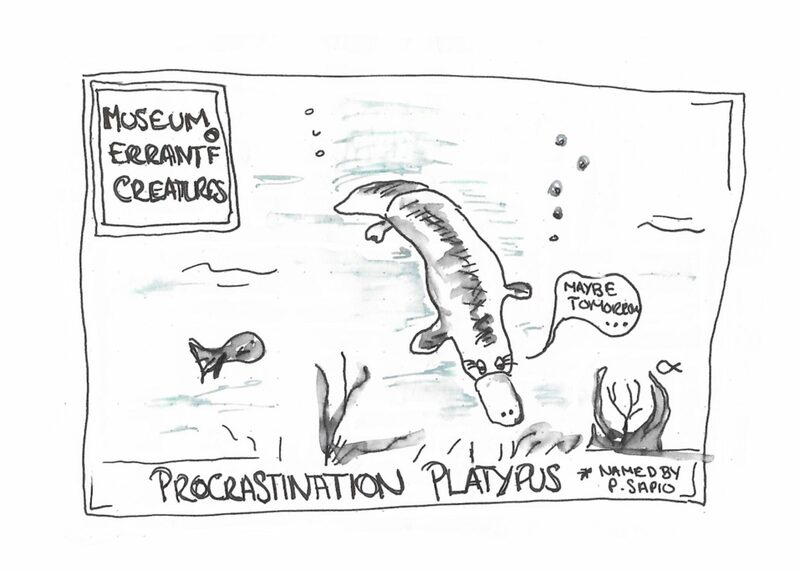 That blasted Procrastination Platypus, though… GrrrR!! This is a dark and dangerous menagerie. Fortunately with this handy guide I feel as if I am under the watchful eye of Critter Control. I’ll call if they decide to procreate under my back deck again. Thank you for taking appropriate precautions! I love this! 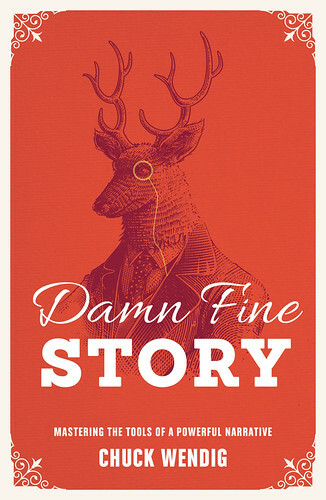 Is it published? 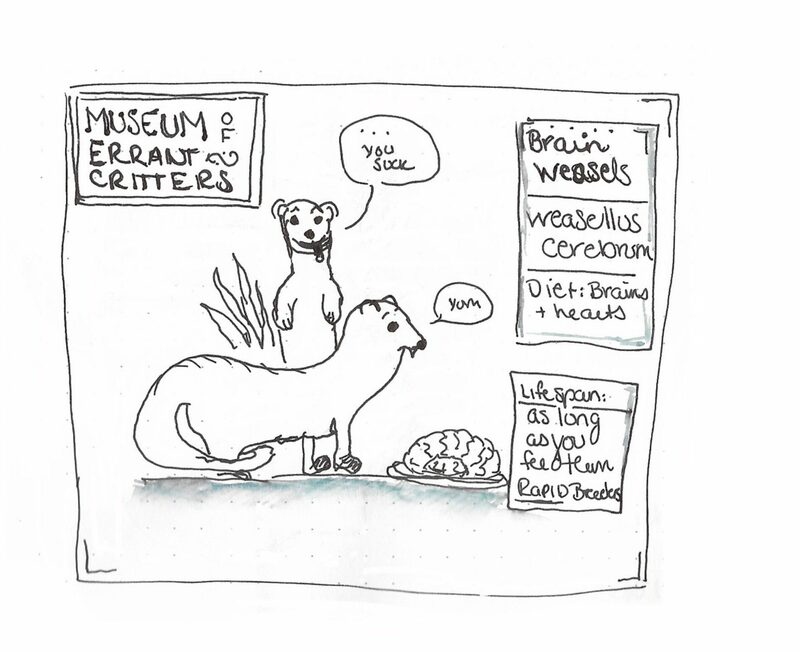 What about the Guilt Ferrets as identified by Kevin Hearne? Kevin and I haven’t talked about them, but I’m sure they’re nice & toothy? Probably cousin to the Brain Weasels. No direct relation to the Guilt Gorillas, although possibly found in close proximity. That or they’re actually the larval stage of the Guilt Gorillas, would be my guess. just very harmless and sweet, as long as you don’t feed them! They’re procreating in my brain. I know it. I hate to tell you this, Fran, but the habitat of these critters is a lot more widespread than the labels might suggest. I’ve seen most if not all of them here in New Zealand, despite the firmness of our well-enforced biosecurity laws. Mind you, I also have the severed head of a Jabberwock in a vase on my desk, suitable for bouncing off the furniture when the work isn’t going well (or, more often, the business side of the work consists entirely of roadblocks).